Product prices and availability are accurate as of 2019-04-01 18:09:31 EDT and are subject to change. Any price and availability information displayed on http://www.amazon.com/ at the time of purchase will apply to the purchase of this product. Sturdy compact foliage and tight bloom stalks. Grows to 24". For sun. Bright red blooms. 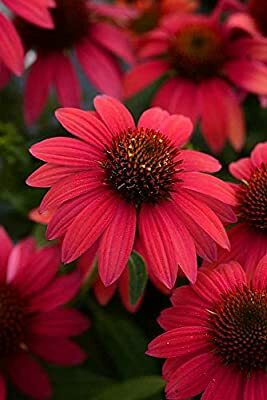 Coneflowers are some of the BEST perennials for a wide range of soils from sandy to clay. Highly drought tolerant once established. Echinacea Sombrero Sandy Yellow's giant fragrant flowers provide the perfect companion to Re blooming Daylilies, drought-proof Sedums & long-blooming KnockOut Roses.